I can't believe it's been over a month since I last blogged. In the past 4 weeks, I've been out of town on business for three of those weeks. I'm finally home for a while with probably nothing more than a day trip or overnight here and there until March. That's good, because while I'm loving my job, I'm also very tired. We are now shepherds having brought home two 6 month old Shetlands from SAFF. I didn't know we were getting sheep, nor did I know they joined the family until almost a week after they arrived. See, I flew from Asheville to Raleigh the Sunday of SAFF and didn't get home again until late on the Thursday after. It wasn't until the Friday after SAFF that I found out we had sheep!! 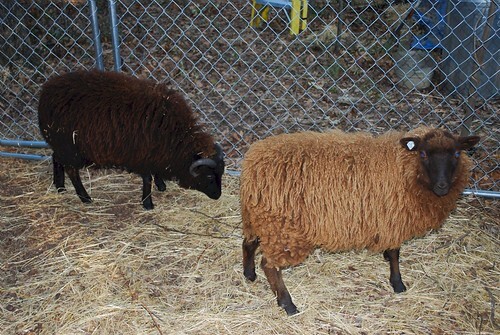 In the left side of the photo is Rebel, a little ram, and on the right is Peppermint Patty, a little ewe. Let's see....after SAFF came Halloween. Daughter and her boyfriend went out begging candy dressed as the devil and the grim reaper. They were cute and had a great time. Did you know the devil wears Converse? And....after Halloween, came election day. I waited in line for 2 hours to vote and would not have missed the experience for anything in the world. I am thrilled at the outcome of the election and very glad to see that America has come to her senses! Now, I'm home for a while, exhausted beyond belief, but happy and still loving the new job. I'm looking forward to settling into a more even routine at work and not having all the meetings. Most likely, I'm home until sometime in March when I have a team meeting, hopefully in Puerto Rico!! !